Business-savvy brides-to-be have a number of people, places, and things influencing their decisions in wedding planning. As a bride planning my own wedding, I find it very important to be aware of the different people that influence my decisions. Staying aware of those elements that influence my decisions helps me to stay true to the core of what I want. There’s a very popular management academic theory that can apply to creating awareness of your influencers. Harvard MBA professor Michael Porter’s most notorious theory, Five Forces, examines the intensity of competition in an industry and how attractive a market is. This brilliant model has helped MBA students the world over examine the influencers in a market. But now, we can shake it up and apply it to brides. 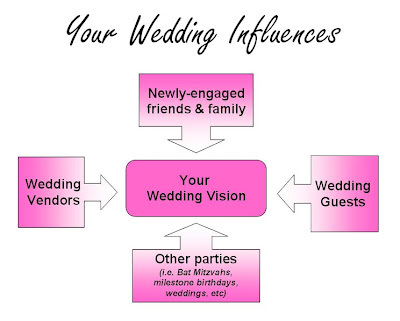 Only the business-savvy brides are aware of the influencers and how they impact a wedding. A quick explorations into each of these categories will help you to be aware of what is driving your decisions and get those overbearing influences under control. This category is where many brides want to have the most influence because they stay true to their vision and their ideas. Despite all other forces, the bride and groom come up with unique, personal, and customized ideas that they drive toward on your day. In a balanced world, the center of the wheel should have the most influence. Although many brides-to-be feel happy for their friends and family who get engaged when the bride-to-be is still engaged, to a certain extent, brides-to-be see this as (in Porter terminology) a threat to new entry. You and your newly engaged friend will compare costs, wedding planning experiences, and more. This will result in you seeking to differentiate from your friend’s wedding. Although differentiation is good, you shouldn’t seek to be different for the sake of being different. Make sure you set up your own criteria for evaluation and not make wedding decisions based on being different from your engaged friends and family members. Brides-to-be have been to a lot of parties in the past. 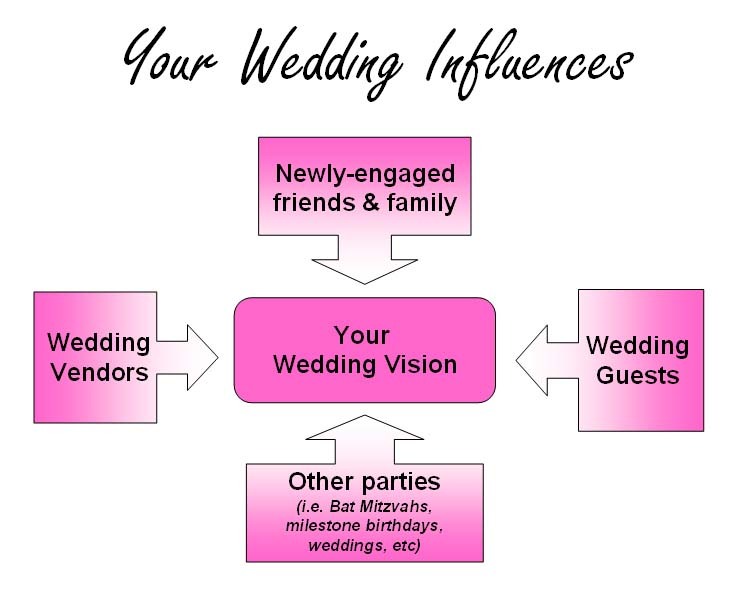 Be it Bat Mitzvahs, milestone birthdays, or other weddings, brides-to-be will most likely be influenced by things they’ve seen and experienced in the past. Although this type of influence has a justified presence in helping the bride and groom to make decisions, an unhealthy obsession with comparing to another party or copy-cat-ing another wedding can lead to an imbalance in the influencing elements. Unless, of course, your wedding vision is to copy the royal wedding or Kim Kardashian’s wedding (just don’t make the same mistakes that Kim did). Brides and grooms to be who show consideration for their guests show courtesy, thoughtfulness, and appreciation to people who witness their union. Having a cookie decorating table for children, a handicap ramp for your aunt in a wheel chair, and even sitting your grandparents far from the booming speakers during the reception show that you’ve thought of other people’s needs too. This influence can be undervalued and unrecognized, so ensure you think through your guests comfort as well. But be cautious, business-savvy brides. Overbearing family members are also guests to your wedding and some may be tempted to commandeer your wedding vision. You must be aware of the delicate balance between honoring wedding guests and getting dominant guests to simmer down in the planning process. You may have your heart set on a particular photographer, baker, or officiant. Those vendors who are important to you should influence other wedding decisions. More often than not, a vendor will be exceptionally accommodating toward you. If you find that you have a vendor who is dominant (for example, an interview experience with an overbearing wedding planner), they may not be the right choice for you. Even if you have an accommodating negotiating style, don’t let your vendors run your show. Each business-savvy bride-to-be must decide the right balance between these five influences. Every bride will have a very different balance, which will lead to a unique, thoughtful, and memorable wedding. The most important step is being aware of those elements that influence your decision making abilities. Do you recognize one influence as overbearing? Share in the comments below and tell us how you plan to get it under control.